The new group had its first meeting on October 15, 2013, and warned residents about the dangers of encouraging panhandling. Raup told of several instances where other crime watch members have reported panhandlers at gas stations approaching patrons with “sob stories” of how they need money for auto repairs, or for their sick child in Danville whom they cannot afford to visit. “It’s the same story week after week, and by now their car must be fixed, and their child out of danger,” Raup said. 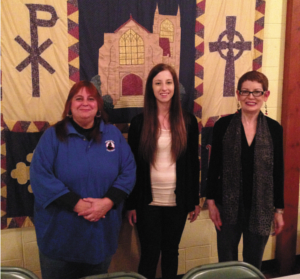 The Solomon’s Creek Crime Watch meets the 3rd Tuesday of each month at 7:00 pm at Westminster Presbyterian Church, 2 Lockhart Street, and is under the direction of its coordinator Mary Ann King, and co-coordinator Katie Grilli. Both King and Grilli said they have seen crime rise in their neighborhoods, and encourage citizens to get involved. Wilkes-Barre Crime Watch members receive instruction on fire safety Crime watch coalition aims to hold defacement at bay Parking garage break-ins trending in Wilkes-Barre Wilkes-Barre Credit Union: Not Related? or Family Affair?